General podiatry and professional care of all skin and nail problems as well as diabetic foot assessments is now also available through our sister clinic ‘Sutherland Foot Clinic’. We welcome qualified and experienced podiatrist’s Luke Bertram, Charlotte Waugh, Monique Bakija and Gary McGill to our team. Sutherland Foot Clinic is the Sutherland Shire’s leading foot clinic which offers Bulk Billing. Head over to the website to find out more. 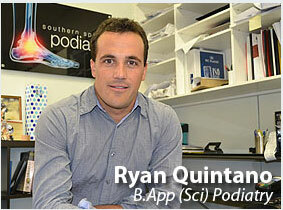 Podiatrist Ryan Quintano specialises in sports injuries, foot and ankle pain, lower limb biomechanics and orthotics. Whether you have a sports related injury, are seeking the proper footwear, or you are looking for a running assessment then Southern Sports Podiatry can help you. Orthotics are specifically designed for sport, general and work use. Orthotics may be used in preventing excessive movement, injury recovery or even promotion of movement. There are different Orthotics to assist in relieving your pain or to improve your biomechanics. Ryan has a special interest in amateur and professional triathletes and has been involved in the sport of triathlon for 7 years. Ryan has an extensive knowledge of footwear which is often the crucial piece of the injury puzzle. Podiatrists are often considered the ‘foot doctor’ of the body. Foot biomechanics are extremely complex, so at Southerns Sports Podiatry walking and running technique and posture are also assessed as this can substantially affect stresses at a foot level. Ryan has a great network of referrers including physiotherapist’s, osteopaths, chiropractors, sports doctors and GP’s as he believes in a multi- disciplinary approach. What are foot problems caused by? Foot problems are often caused by poor: upper body control, core stability, hip and pelvic stability, knee position and the list continues. For this reason the initial consultation at Southern Sports Podiatry, is usually an hour and includes detailed history and full gait analysis. The most detailed assessment in the Sutherland Shire. Being Sports Podiatrist, Ryan readily utilises allied health as well as pilates in Sutherland, Menai and Cronulla and gait re assessment to assist in injury recovery and more importantly future prevention. Ryan also runs Integrated Running Solutions (IRS) with physiotherapist Lauren Atlee. IRS a running assessment program, designed to improve running: speed, comfort and efficiency as well as prevent injury. It is a comprehensive 2 part theory and practical course that includes physiotherapy non weight bearing assessment, podiatry lower limb biomechanics assessment, video gait analysis (front, back, side) and full report for your referring practitioner. IRS gives you the knowledge of the importance of muscle recruitment, strength, flexibility and gait re training to teach you the skills to run efficiently, improve your speed and running comfort. Ryan Quintano is a fully Qualified Podiatrist graduating from the University of Western Sydney in 2005. SSP is now well known as the Sutherland Shire Podiatry clinic to go to. Ryan has extensive experience and has a fantastic disposition with patients. Many runners and triathletes from Cronulla Triathlon Club, Engadine Triathlon club, Sydney survivors, Tribe Social Fitness, BWhipp Fitness, Elite Fitness Cronulla and F45 Caringbah and Cronulla have all turned to him for assistance, injuries and injury prevention.